Please note that the content of this book primarily consists of articles available from Wikipedia or other free sources online. Waldorf is a city in Waseca County, Minnesota, United States. 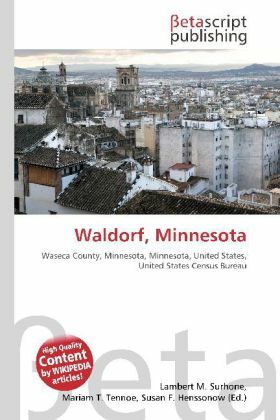 The population was 242 at the 2000 census.According to the United States Census Bureau, the city has a total area of 0.4 square miles (1.0 km²), all of it land.As of the census of 2000, there were 242 people, 103 households, and 70 families residing in the city. The population density was 630.4 people per square mile (245.9/km²). There were 115 housing units at an average density of 299.6/sq mi (116.8/km²). The racial makeup of the city was 99.59% White and 0.41% Asian. Hispanic or Latino of any race were 1.65% of the population.